Note: If you don't already have a HydroFloss Oral Irrigator - It is one of my top recommendations. I hope this information has helped you to find the Sensonic. If you need further assistance, don't hesitate to call the number at the top of your screen. the original sensonic post was here. How Is The Hydro Floss Different From The Water Pik? I thought I would share this conversation I recently had with you and then I'll expound on this topic a little further. Visitor: What is the difference between the Hydro Floss and my regular water pik which has a lot of attachments? Me: Are you happy with your Water Pik? Is your dentist and hygienist happy with your gum health? Visitor: I love my Waterpik but my periodontist says to continue to use the pik if I want, but he doesn't think they do any good... he just recommends flossing and brushing. Me: So, do you still have periodontal issues going on? Me: Then, that is the difference. The Hydro Floss has helped a lot of people, including me, with our periodontal health. Visitor: OK, I will consider it, thank you. Me: Can't guarantee it 100% for everyone because we are all different, but it has worked exceptionally well for a lot of people. Well, that's only part of the story.. Have you read my book: How To Stop Gum Disease In 4 Easy Steps yet? Visitor: Starting too. I will read it. Me: Many periodontal treatments are very expensive. Me: and potentially painful. The Hydro Floss saved me from a SRP or Scaling and Root Planing Treatment. -that saved me abut $1500 bucks right there. And, I have been able to keep my gums healthy since then. How much more have I saved? Often times, those deep celanings, even laser surgeries, need to be done again in 1 to 3 years. I talked to a man last week who told me that his periodontal laser treatment was guaranteed to insure he would never have pockets again. - that's what he said the dentist performing the procedure told him. 9 months later, he had deeper pockets again. But, how is it different? The hydro floss has a magnet in it. This magnet is mathematically correct according to principles discovered by Michael Faraday - a LONG time ago. When minerals contained in water pass through the magnet, a charge is placed on them. That charge causes the plaque and bacteria to become less adhesive and to come off easier. Studies have shown that this leads to a greater reduction and plaque and tartar build up between regular dental cleanings. This in turn, often equates to periodontal pockets shrinking . Generally speaking, most dental practitioners will consider your gums healthy when these periodontal pocket depths are at 3mm or less. That's the end goal and what you are shooting for. There is a link on the right sidebar to 'effective hydro floss use'. That's worth reading to get the most out of this review. The Watperpik Ultra Flosser is one of the best designs that waterpik has come up with. It is quieter than previous versions and has a lot of conveniences. 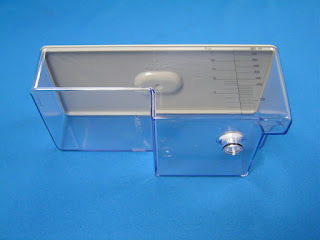 For example, it has a tip holder built into the reservoir. This gives you a convenient place to store your tips that may help you keep track of them. It's comparatively easy to lose a tip (or two) when they don't have an organized place to rest. If you stick them in a drawer or unknowingly knock them off the bathroom sink and then accidentally sweep them off the floor and dispose of them, then they are gone, lost. The container helps to reduce those negatives. Water floss irrigation is pretty cool. If you have never used an irrigator before, you might be surprised that even after a thorough brushing and flossing, you still find particles showing up in the sink. What kind of trouble are those tiny food particles causing to your dental health when they remain stuck between your teeth and gums for long periods of time? Gum disease is the number one cause of tooth loss. Worse, 75% of people, according to dental professionals have some right now. Making or keeping your gums healthy should be a top priority to you. You can learn more about shrinking periodontal pocket depths. When choosing an oral irrigator, this is a good one. But there is one step higher. It wouldn't be right if I didn't tell you about this. You can read about the power of an irrigator with magnetics here. If that doesn't resonate with you, by all means, get the Ultra Flosser. Question: My Hydro Floss Reservoir shattered, what can I do? Answer: No problem, so long as the oral irrigator you are referring to his a Hydro Floss. The nice thing about it, is that the Hydro Floss hasn't changed in 25 years. So, no matter how old your Hydro Floss is (as of June 28th 2013) This reservoir will fit it. You can also order by phone at 1-888-586-6849. 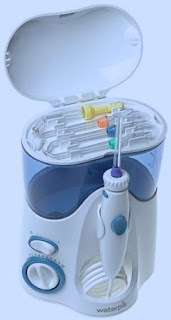 This is the Waterpik Ultra Flosser wp-100 made by waterpik. The Ultra Flosser offers 1200 pulses per minute. It has a pause button on the handle. The Wp-100 offers a pressure range of 10-90 PSI (pounds per square inch) with 10 pressure settings. Flow rate is 400 ml / minute. 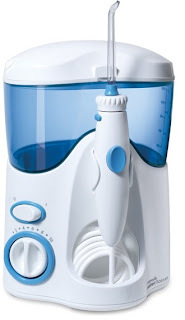 The Waterpik Ultra Flosser WP-100 is a type of oral irrigator. Oral irrigators are for shooting a 'jet stream' of water to help clean the teeth and gums of debris. Periodontal health is very important because gum disease is the number one cause of tooth loss in the world today. At the time of this writing, I did find a reference that stated this unit is only sold in the United States. They designed the machine to be quiet. Some reviewers also noted that it was quiet.